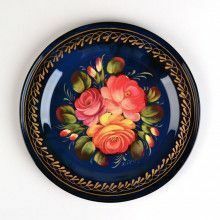 The people of the Zhostovo village have been involved in harnessing their skill of making decorative trays for over 150 years. 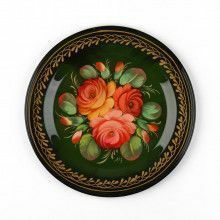 The trays carry brilliant images of bouquets, gardens and flowers against black background highlighting the diversity of nature. 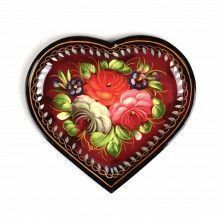 This tradition of tray making began sometime in the 18th century. 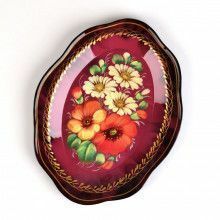 This art of tray making was pioneered by Filipp Nikitich Vishnyakov. In the early 19th century the tray making art was hit by a crisis. With slowing demand and shrinking production the artisans left their workshop for farming and other seasonal work. It was only after a decade of slump that there was an overall revival of this art and resurrection of Zhostovo. With increased production, the idea of paper mashed with metal was introduced, and this led to more durable trays. Then came the Fedoskino technique of layered paintings. While imbibing these new techniques Zhostovo artisans continued to develop their own style of decorative floral paintings. 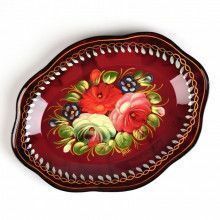 Today the Zhostovo trays are painted using the Filbert brush. Then modern material like gel and clear glaze bring out the properties of oil paints used in the original paintings. The art of tray making was not lost with the growth of cities, expansion of hotels and bars in fact the Zhostovo masters found themselves a new market and cynosures. This increase in demand helped them rework their traditional styles and make them inimitable. The tea glass holders were a practical invention to hold the extremely hot glasses of tea, which the Russians liked to drink soon after brewing. Many a ‘hot’ accident would have prompted the development of tea glass holders, which, in turn must have been responsible for preventing many more such accidents. As is normal for any product, with time, the tea glass holders moved away from being merely practical to being practical as well as ornamental. Soon, tea glass holders were developed more as works of art and souvenirs that were passed proudly from generation to generation. 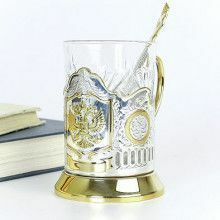 The majority of Russian tea glass holders are produced in the town of Kolchugino in Russia. 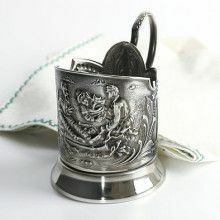 The metals most commonly used in the manufacture of the tea glass holders are silver and nickel as well as their alloys. Silver by itself, may not be the best choice because it is a very good conductor of heat. 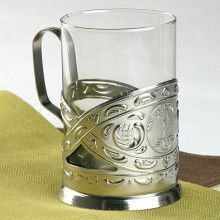 But various silver based alloys are perfect materials for tea glass holders. Technically called tea glass holders, but you don’t have to use it only for drinking tea, do you? Why not convert it into an interesting milk glass holder for your toddler? You might be amazed at the high rate of disappearance of the normally ‘unpopular’ drink. 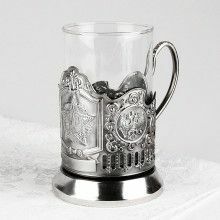 Occupying a position of honor among your cutlery and mugs, these Russian historical relics are sure to add a touch of elegance to your tableware and your home. Serving tea in ‘podstakannik’ is the traditional way of tea drinking in Russia, Belarus and Ukraine. Though many urban homes in these countries have moved towards drinking tea in mugs or cups, in the rural areas or at railway stations, tea glass holders are still used. In a world that is getting increasingly xenophobic, adopting this small bit of foreign culture in your home can help in opening your heart to others’ beliefs and values. If you look at it this way, the Russian tea glass holders are much more than mere vessels that protect you from hot teas. Though, of course, that is still an important practical use, isn’t it?